Oriental cuisine has not only unusual taste, but also smell that pleasantly tickles the nostrils even before the dishes served at the table. Uzbek cuisine is unthinkable without the aromatic herbs and spices, creating a whirlwind fragrant, even over the most common dish. Commonly used herbs, both in fresh and in dried form - it is kashnich (coriander), dill, parsley, mint, saffron and, of course, raihan - the main local herb - known worldwide as basil. 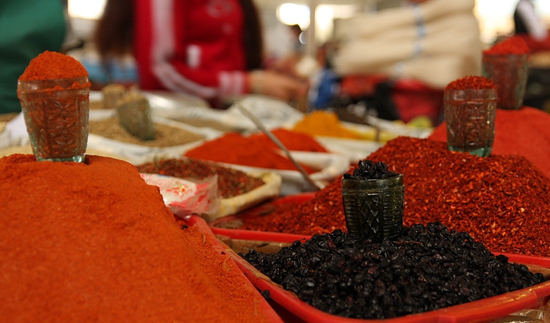 Spices and herbs in Uzbek cuisine are not only used as an appetite pathogen, but also an assistant in the digestion of the abundant and mostly fatty food. It has long been known that green helps digest any food, so it goes perfectly with all products. Greens are being dried in Uzbekistan for a long time and everywhere. Any housewife has is this fragrant dried herbs in stock, which when added to a hot cauldron, filled the whole house with scent, promoting the release of saliva and gastric juice, and as a result awakening appetite in whole household. The grass is most often dried sliced, the pods of bitter red and sweet peppers are dried whole, while maintaining their original appearance. All spices are dried in summer, but in the shade, the sun should not touch them with its rays and not take the natural color, taste and smell. Ask any Uzbek what he would put in a dish to make it even tastier, almost everybody answers - cumin. This spice is widely regarded as the main spice among peers. It is added to the first and second courses, appetizers and salads. The main dish of the Uzbek cousine pilaf is also cooked with cumin, it is as important as the main ingredients of this dish. Oriental spices give the dish is not only unique taste and aroma, but also make them useful, contribute to the rapid assimilation of food. Counters with the spices are present any Uzbek market. Oriental spices are sold in bulk, as magical powders, and really, they work wonders - a pinch of spices can cause appetite by hundreds of people who only breathe in their fragrance. And once inhaled, the fragrance will not be forgotten forever. They say the most universal language is the language of music. Coming from time immemorial, it inexplicably embodied the strength of the people, building and ennobling the soul. Among the peoples of the Ancient East this spiritualized beginning is inherent in traditional classical music-vocal genre - "maqom". In Uzbekistan the skullcap is part of a national costume. However today, this element of a headdress became popular and among women of fashion of the capital. Often a skullcap is combined with modern clothes adding into the image a bright, national detail.